On YouTube, Facebook, Twitter, Reddit, and other online comment threads, you are bound to see the expression "'haters gonna hate." You may also see the expression used as a caption on photos of people and animals performing outlandish stunts and strutting moves. The phrase means "I'm just going to ignore the cruel and hateful comments of other people." The "haters gonna hate" expression is commonly used when a person performs some kind of peacocking behavior that demonstrates individuality, and that person wants to shout, "I don't care what other people think!" The phrase is also used to counter hateful comments posted on social media or in comment threads about an individual. 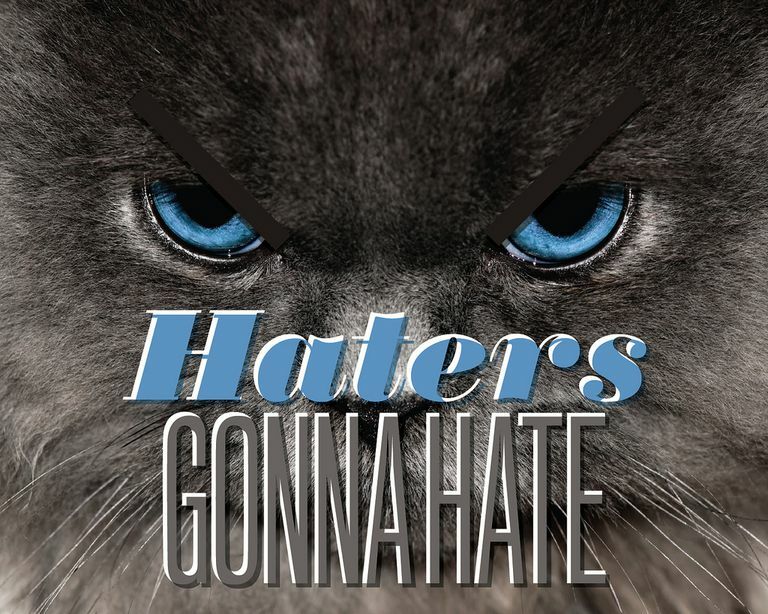 In these cases, a person expresses an opinion or posts an image, a "hater" posts an ugly response, and the original poster responds only "haters gonna hate." Haters are people who are malicious and vocal and who likes to post insults online whenever they disagree with something someone posts. Young people use the expression as a part of their everyday language. Teenagers regularly say "haters gonna hate" as a vocal response to cruel and hateful judgments by others, although the term has gained broader cultural appeal. Former congressman Aaron Schock of Illinois said it to the press when he was confronted about the costs of his office renovation in the style of the TV show "Downton Abbey." Modern meme photos heavily use the "haters" expression. Expect to see photos and animated gifs of people expressing themselves with a disregard for the negative opinions of others. Sometimes it isn't so easy to blow off someone who posts a hateful comment. You may encounter people who post bigoted, racist, or militant comments. This type of behavior can damage a social community, and it should be flagged for review by the social network or thread administrator. If a hater ever threatens or stalks you, it is time to notify the authorities for your own protection. The origin of the "haters gonna hate" expression is claimed to be a 3LW music video from the year 2000. 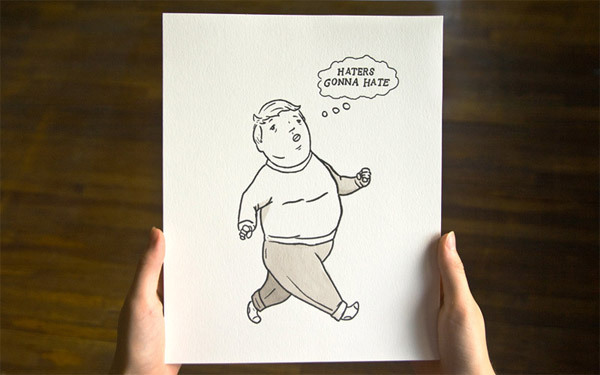 A cartoon from artist Omar Noory drew a captioned version of the haters-gonna-hate phrase in 2008. Tha-tch: wtf, that imperial is yelling at me because I pushed him over the side of the bridge. obnotlupus: dude, seriously? you painted your car by wrapping it in duct tape? gramathy: haters gonna hate. Obno: go take a chill pill or move to a country that doesn't have democracy. Leave the guy alone and let him paint his car the way he wants to.